Upon my first encounter, I wanted to hate this place. The décor—with wallpaper of old theatre announcements, twee paintings of bug-eyed anime children, mismatched vintage furniture, and big communal bowls of brown sugar lumps—is so self-consciously bo-bo that it’s painful. The well-heeled crowd is actively torn between the desire to dine there (often waiting in lines down the block on Sundays) and the affectation that they don’t desire anything at all. The pacing of the Le Loir is tense with the contrast between those slowly brunching (or enjoying a gros matin, as my friend B informs me) and those hungrily waiting for a table. However, I’ll readily admit: the food is good. I mean, really good. 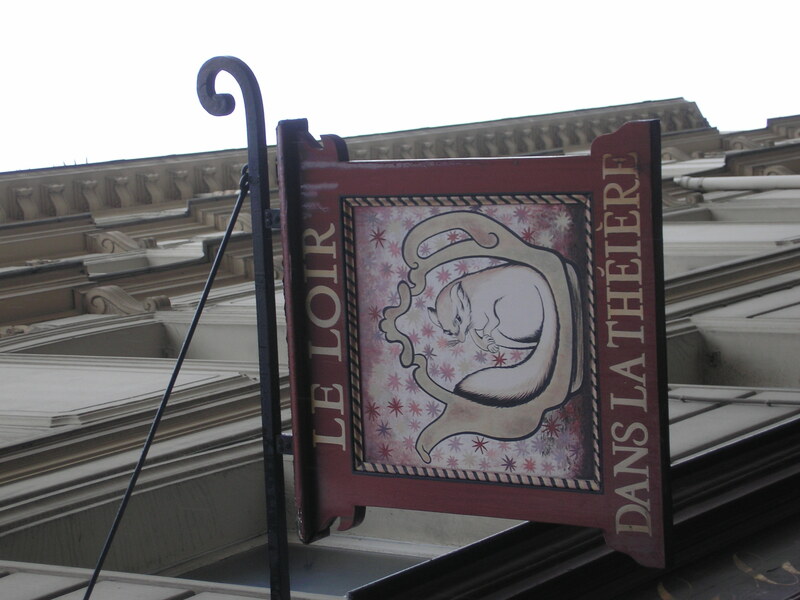 If you are a fan of tartes (sucrées or salées) this place is for you. I’ve so far sampled the zucchini/goat cheese, shallot/goat cheese, and the camembert/spinach/walnut ones at the savory end and the pear/almond custard and lemon meringue at the sweet. They are all perfect. The lemon meringue is a feat of egg-white architecture and requires about three people to effectively polish off. For sheer sophistication, I died over the combination of almonds custard with perfectly ripe and caramelized pears. I’m told that there is occasionally a rosemary and wine-stewed peach tarte, but it has regrettably not made an appearance during any of my visits. They also make a lovely omelet, especially the one filled with goat cheese and fresh mint. I haven’t tried the “brunch” formule, which involves croissants and bread, eggs, yogurt, compote, coffee and juice. Sounds like a 20 euro “Continental” breakfast to me, and that is only impressive when it’s free. Despite what I read on the internets, I wouldn’t say that the service at Le Loir is especially bad. It isn’t especially good either, but I think that it is right on par with what you might expect at any busy Marais restaurant. Le Loir is a lovely place for an afternoon coffee or delicious Darjeeling and they won’t hassle you if you bring a book and stay for a few hours, provided it is a weekday. Details: Open everyday until 7 p.m. You must order something to eat if you come in before 3 p.m. on weekends. They will not hesitate to kick you out of you occupy valuable brunch real estate and only intend to drink coffee. Savory tarts and omelets are about 9 euro; sweet tarts (more than enough to share) are 7. Get there before noon on Sunday and you’ll have the table of your choice; arrive any later and be prepared for a long wait.